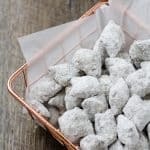 The traditional Puppy Chow recipe gets a few upgrades with my Peanut Butter Pretzel Puppy Chow. And a secret ingredient that will take it to another level! Get prepared for the mess that is about to happen in your kitchen. Grab 2 gallon-sized ziptop bags. Put a 1/2 cup of powdered sugar in each bag. Grab a large bowl and add your peanut butter stuffed pretzels to it. In a large microwave-safe bowl add the chocolate chips, butterscotch chips, and butter. Microwave in 30-second bursts until the butter and chips are melted, stirring between bursts to prevent burning. When the chocolate is all melted, pour over the peanut butter stuffed pretzels and stir to coat all the nuggets as even as possible. Scoop out a 1/4 of the chocolate covered pretzels and place one in each bag with the powdered sugar. Add another 1/2 cup powdered sugar into each one. Add another 1/4 to the chocolate covered pretzels into the bag. Cover with the last 1/2 cup of powdered sugar to the top of the chocolate covered pretzels to each bag. Seal the bags leaving air in them. Shake the bags and use your hands to break up the chocolate covered pretzels so they can get completely covered. Store the peanut butter pretzel puppy chow in the bags with the extra powdered sugar. You might need to reshake every now and then.